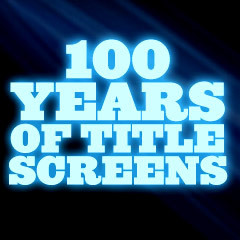 Movie Title Screens - 100 Years of Memorable Title Screens: Title screens are the initial titles, usually projected at the beginning of a film, and following the logos of the film studio. They are often an ignored aspect of films, although they reflect the time period or era of the film, the mood or design of the film, and much more. Title screens in this section include a memorable collection of choices - Oscar-nominated and Academy Award winning films (and performances), milestone films, important foreign-language entries, memorable films, and more. They are displayed in chronological order.